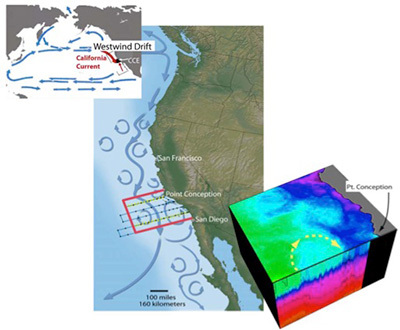 How will climate change affect the ecological and socio-economic sustainability of important fisheries of the California Current System along the U.S. west coast? The area off the California coast supports productive commercial and recreational fisheries that are important to human cultures, quality of life, livelihoods, and the economy along the U.S. West Coast. Climate change is expected to alter the oceanic system and contribute to changes in fish populations that will directly affect the behavior and profits of people who fish, as well as actions of fisheries managers. This collaborative study brings together oceanographers, fisheries scientists, economists, and social scientists to develop a better understanding of interactions among the climate and coastal ocean system, fish populations, fishermen and fishing communities, and resource management. The investigators will examine how fishing behavior, income, jobs distribution, and livelihood viability will be altered by climate change. The focus is on three key commercially harvested species that are known to respond to environmental change: Pacific sardine, California market squid, and California spiny lobster. Each of these supports an economically important fishery and represents a different type of organism in terms of marine habitat, latitudinal range, and time scale of response. The approach will include global climate model projections, regional ocean modeling, fisheries modeling, economics modeling, as well as studies of fishermen’s behavior and ability to adapt to change. The goal will be to better understand the likely ecological, social, and economic outcomes for these three fisheries to help develop socially and ecologically sustainable management strategies under future climate scenarios. Spatial characteristics: How does the current location of fishing effort overlap with predicted fishery characteristics under altered climate scenarios? Seasonal characteristics: How do current seasonal aspects of fishing overlap with predicted shifts in fishing seasons? Are there any conflicts with off-season sources of income to fishermen? Reliance on other species: What other species do fishermen rely on for income? How does this contribute to the potential stability of the fishery? What is the potential to shift to other species if stocks of primary target species decline (given fishermen’s gear, experience, mobility, license requirements, etc.)? Mobility: How far do people travel to catch fish? What are the limits to their mobility if the range of target species shifts under altered climate scenarios? Infrastructure: What facilities and infrastructure do fishermen rely on? What are constraints on fishing behavior due to infrastructural limitations? Vulnerability or resiliency to climate impacts: How flexible are fishermen in their behavior? Will they be able to adapt to predicted changes? How have fishermen adapted to short-term climate variations in the past, such as El Nino/La Nina conditions? What impacts might these changes have on people’s livelihoods? Perceptions of management alternatives: How do fishermen respond to different types of management alternatives? How do fishermen and other stakeholders involved in each fishery perceive climate impacts on the fishery? What would be desired changes based on modelled predictions?